Shorty after introduction of F-4F Phantom II into service, Luftwaffe recognized that the usual Norm 72 camouflage scheme was not optimal for air-to-air combat. In 1976 a research work was started (with help of JG71 "Richthofen" and JG74 "Mölders") aimed at developing a new universal camouflage, suitable both for fighter and fighter-bomber roles. The resulting Norm 81 scheme was introduced in two variants - 81A with camouflage pattern of polygonal shapes and 81B using the same colours but in irregular shapes. The Norm 81 scheme had been officially used until introduction of Norm 90J, but was observed still in late 1990s. 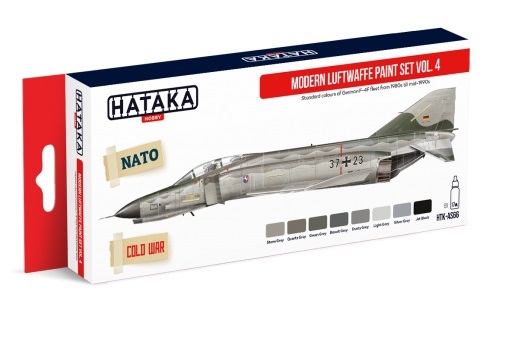 HTK-AS66 includes standard colours of German F-4F fleet from 1980s till mid-1990s.